Food for Thought! : An unusual China! China is known for its censorship and how it keep media at bay. The way it polices the internet is all known. 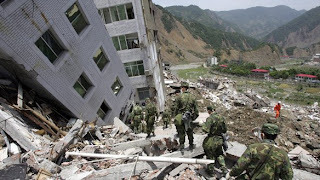 There has been instances where the government has detained reporters and correspondents for trying to report from the spot on an explosion that killed many children in a school in Jiangxi province, in 2001. The country is very particular about what gets printed in the media about the country. Yet this time, there is something unusual that has happened, in terms of openness and press access. As the country got struck by earthquake, I could see pictures flooded all over the news channels from morning to evening, live right from area where the event took place. May be this might be an historic turning point for China, on its journey towards modernity and openness. I have never seen so many pictures on the media ever before from the ground china. Now, the openess to media may have raise doubts on the preparations for Olympics, why the government was not able to recognise the event early, corruption, why the structures that collapsed didnt meet the standards, etc. But in a way this will also help China by getting aid from other parts of world, like this time, if such event occurs. Also, openess to media would help to install transparency and reduce corruption in the country.